Now there’s a gamble. A Romance n0vel with a Catholic theme yet my writer friend Deanne Wilsted has persevered. 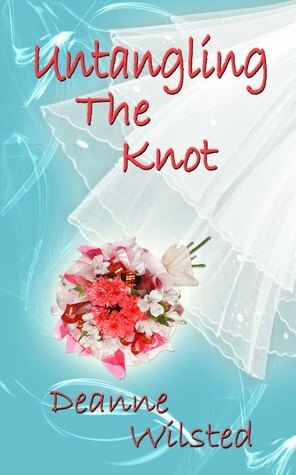 Her novel, Untangling the Knot is a charming novel of Gabrielle Bessu, a wedding planner at St. Therese who makes a simple scheduling error (ok, it’s a very far-fetched one, scheduling a couple for an annulment instead of a wedding but hey, crazier things have happened) regarding a young couple that want to get married. When she tries to clear up the mess she only succeeds in falling for the children of the man about to marry. Gabrielle helped plan the funeral of Ryan’s first wife, Evie and when they meet to plan the wedding they are launched on a collision course of incense-laden love. Thank you for hosting this tour. Thank you so much for hosting me today and for your nice review of my book. As a born and raised Catholic I have had some experience with the whole guilt thing, so I suppose that is how I made it authentic in my heroine:>) I admit to being a bit nervous, waiting for my Catholic Sentinel review to come out… I wasn’t sure what they would think of a romance book. So, you can imagine my relief and excitement when they gave it a wonderful review (phew). I’m looking forward to hearing what your readers have to say about their own tangled up knots so I will check back in and reply to their comments or questions. In the meantime, I just wanted to say a huge thank you for sharing the journey! You’re welcome Deanne. In case you couldn’t tell I grew up Catholic, went to a Catholic school and spent my Sundays as an altar boy at St, Joan of Arc Church. btw – re the tweeting… every person is a superhero. That is part of or job!